It was never the plan to move forty-seven times after I left home, traveling from coast to coast and back again in an old Ford van named Hamlet that carried everything we owned, including a Siamese cat. We were pursuing careers in the theatre, Justin, my ex, and I. After four years of marriage, without a penny to our names, our son Charlie came along and made his début with us at the age of two (on the same stage he later performed and met the woman he married) because we couldn’t afford a babysitter. We settled in Chapel Hill, North Carolina when he started kindergarten. Then, with sixteen years of marriage behind us, mountains of highs and lows and a lot of drama not on the stage, we divorced. That wasn’t the plan. After five years of rebuilding my life, self-esteem and bank account, I re-met my big brother’s best friend from high school. 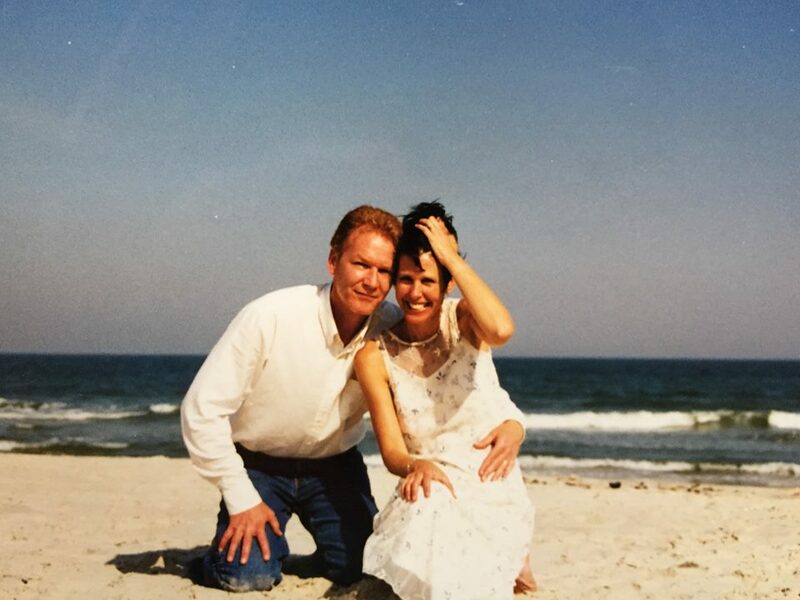 Todd and I fell in love, eloped on Pawley’s Island and eventually bought the house he hung out at in high school–the one I grew up in. 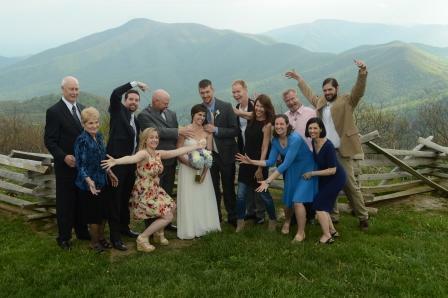 My son and his wife had a small, stunning wedding in the Mountains of West Virginia and here we all are: Charlie with his bride and her family, and Todd, Justin, Charlie’s friend J.D. and me representing his. It’s taken me a while to figure out what this blog is about. It began as a memoir of sorts as I was writing my dad’s stories, but when I lost the courage to tell my story, I started recording my daily observations and reflections on faith which is the thread that’s beginning to tie this all together. Right, God’s plan, not mine. I like cooking, sharing a good bottle of wine with Todd and friends, think popcorn is a perfect food and am CEO of a nonprofit arts organization in Milwaukee, Wisconsin called Danceworks, Inc.
After twenty-five years away from my hometown, it was great to move back when Todd and I got married and be near my family again. My mom had cancer and the time together was really precious. She passed away in 2011 and my dad in 2016, but not before I wrote down his stories about life and faith which eventually became my book Conversations with Dad. A teacher once told me that what is not remembered in love is forgotten. I discovered God uses our fears and failures for good. We are able to look in wonder at this exquisite patchwork quilt called life that only He could create out of our fragmented and tattered lives. My disappointments and hearbreaks are less recognizable in His artwork as love threads it all together. I wanted to be an actress but He has given me so much more than I could have ever hoped for or imagined. So after decades of God’s work, I wrap His quilt around me and feel its warmth. As I glance over it to take in the beauty of its colors and textures, my memories wash over me and begin to flow through me with a new sense of freedom. If I can find the courage, maybe it’s freedom gained to help free another. Safe inside the quilt of God’s Love, I realize things may not have gone according to my plan. But eventually, as I surrendered, they began to go according to God’s. I keep rediscovering that He works for the good of those who love Him, who have been called according to his purpose*. If he can make my mess into something good, He can do it for you, if He hasn’t already. Thanks for reading, Catey. Hug back. My first read of your blog. Just beautiful. Thanks for sharing! I really love your writings, creative insights that stir deep within my spirit… I geti it. Thanks for sharing what you observe and learned. I’m new at your blog and glad to be here. Thanks Dan! I appreciate that! Debbie, Debbie, Debbie….perhaps I need you to co-author my book!!!! I am in tears. Thank you for sharing so poignantly your stories. They always leave me with something to reflect upon, with tears, being happy or melancholy and touched by your words & sharing. Thank you!!! Beautiful Deb, I look forward to reading more of your reflections. Thanks Mel, really great to connect again. Hi Debbie! Nice to meet you, you are a great writer, the way you write is just amazing, your stories are great. Looking forward reading more about your stories. Happy Blogging! You’re so kind. Right back at you! I look forward to reading yours! We’re off for a road trip now. Dear Deb… Your kind words so encouraged me this morning! I feel as though we have been friends for a long time! I can’t wait to read your book. It should arrive on Sunday, or at least, Amazon says so. 😉 I pray that whatever it is that Abba has asked you to carry right now that He will give you inexplicable strength for the path. Your writing speaks to the heart and is full of grace. I’m so glad I found your blog. What a wonderful gift from God! ❤ and hugs! I call the journey my path to the moonrise. I saw my first one after my brother died and the moon’s reflection on the water looked like a path to heaven. It felt like God’s “painting” showing me that, though I couldn’t see him, my brother and I were still very much connected. Looks like, we’re on that journey together. 🙂 What a gift and what a Joy to journey with Jesus and those he puts on my path. Thanks Lynn. Your blog is simply stunning! This is beautiful, Deb. I love the analogy of a quilt. I’m sorry you have been through so much, but I’m grateful God has given you insight to see how He made your mess into something beautiful. Broken made beautiful. I need that reminder every day. Blessings to you! Thank you for your kind words Trudy. Freed to Fly. That says it perfectly! So glad to connect through Lynn Abbott’s Blog! I no longer have my grandparents and my parents, those who defended me and my brothers throughout their lives, and they continue to defend us, with the result of their struggle, work and their dedication to us all. They remain alive in my mind and memory, like all those who have been used by the Lord to build an environment that serves His Glory. And today I am reminded of my mistakes, lack of love, humility, respect, faith, because everyone also had their own demands, limits, and needs, just like me. “Your father and I fought our fight, fight your fight,” my mother told me. Your worthy example tells me the direction, and do honor and showing me and others that it was worth, that your struggle was not in vain, strengthens my faith. In the hope that all strife, evils, and mistakes can be used as “wood for baking bread”, as a testimony, and that “bread” can be used to feed someone. The Lord works and makes us useful. My apologies for missing your wonderful comment earlier!